This entry was posted in Arts, Books, Culture, Learning and teaching, Literary minimalism, Literature and books, People, Writing and tagged aesthetic, Hemingway, Mr and Mrs Eliot, repetition, short stories, style, writing by philgreaney. Bookmark the permalink. Hi, I was just thinking about reading Hemingway for the first time. Have one you might suggest? Hi, yes – I would recommend you try his short stories first. These seem to be what people enjoy most and they often reflect Hemingway at his best. Something like the ‘First 49 Stories’ or even the ‘Collected Stories’ if you want to get to know him over his entire career. I don’t think you’ll be disappointed: reading Hemingway, for me and for many, is a marvellous experience. 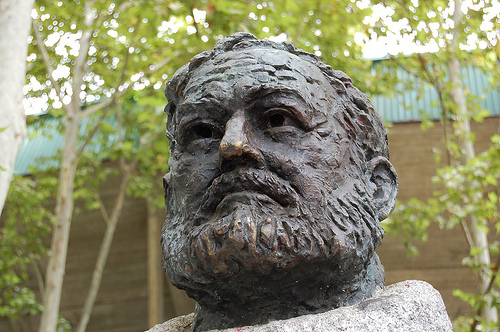 Good luck, enjoy Hemingway, and do share your thoughts on how you find him.